DIS creations deserve few tips to be kept at their maximum splendour, that's our list. Never wear the same pair of shoes for two days in a row. This will help prevent use and will dissolve all the dampness, avoiding bad smells formation. Keep your shoes in their shoe tree – this helps them dry out and prevents wrinkles, keeping them in good condition for years. See for yourself! 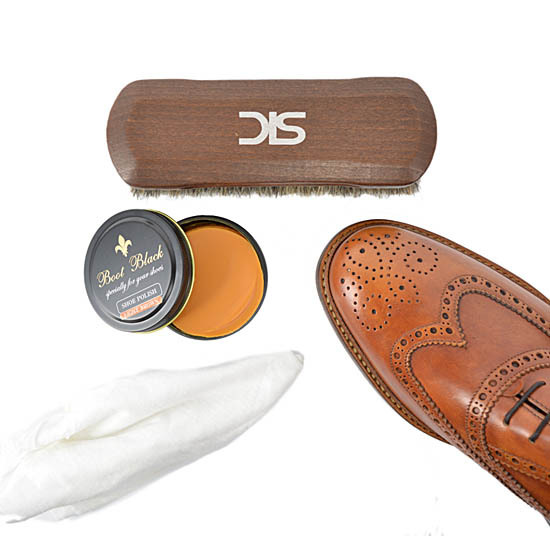 Always clean your DIS shoes using a cotton cloth before applying a wax based polish; brush vigorously and remove exceeding polish with a clean cloth. Polish is used to hydrate leather and to give back its grease and wax lost. For a correct shoe cleaning what you need is to use the right wax based polish depending on the the leather of your shoes. 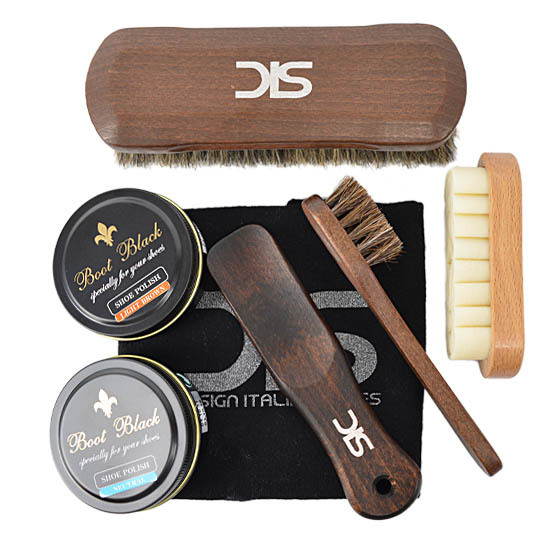 The perfect shoe care set should always contain the right brush to remove dirt, tone on tone polish, polish brush and a cotton cloth; remember to use para rubber brush for suede and horsehair for calf leather. 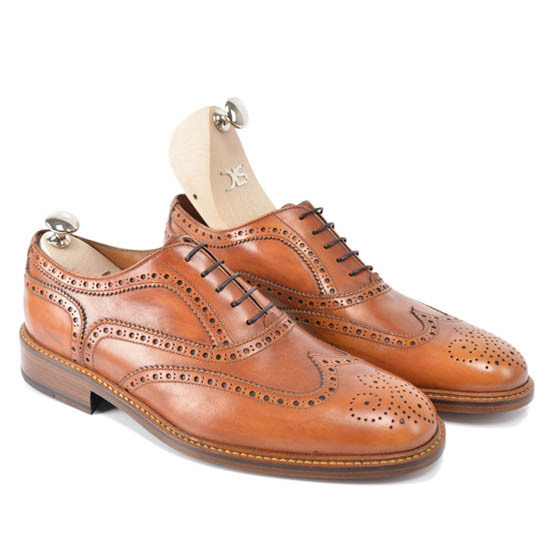 If your shoes have brogue decorations, the polish will get into the holes and it should be brushed until any excess is completely removed, otherwise dust might get in. Remember to apply polish every time needed. 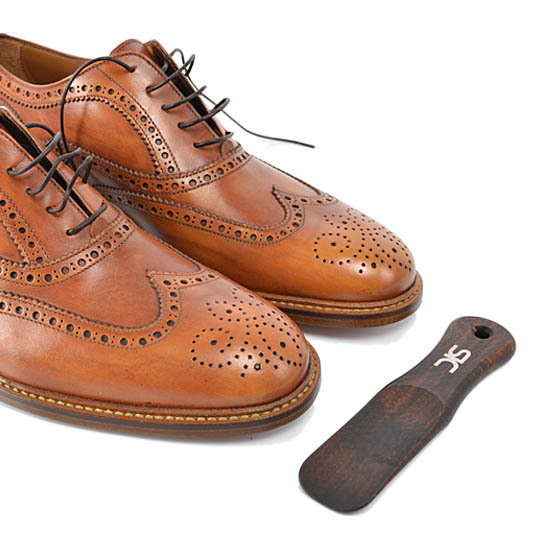 When putting shoes on is always better to use a shoehorn to avoid deforming the back of the shoe. On the other hand, when removing the shoes, laces should be untied completely to easily allow feet out. In case a pair of shoes will not be used for a long time, it is recommended to apply a thin polish layer and store them back in their shoebox, sole down. This will keep them brand new for long!